In collaboration with the Student Union and the Enough is Enough campaign we are running a support group over the whole academic year. This group is open for SOAS students who have experienced childhood sexual abuse or any other form of sexual violence at any age, including recently. It be taking place every 2nd week from the 27th of November 2018 until July 2019. Before joining the group you will be offered an individual meeting with the facilitators to have a chat to make sure the group is the right thing for you and give you an opportunity to meet us and ask any questions you may have. You can sign up for this here. The group will be open for more students to join until we have reached the maximum of 8 participants - currently there are still places available. 5-7pm: Drop-in on one-to-one basis (you can bring a friend if you like), open to all students and staff members, survivors as well as those who want to know more about the topic and learn how to support survivors. Please book a slot through the form below. This is an open group for students who have experienced childhood sexual abuse which takes place every second Wednesday from March to July 2018. If you want to join the group, just book a one-to-one slot in one of the drop-in sessions which take place every other Wednesday so we can have a chat about the group before you join. Update: This weeks drop-in is now fully booked. This is an open group for students who have experienced childhood sexual abuse which takes place every second Wednesday from March to July 2018. If you want to join the group, just book a one-to-one slot in one of the drop-in sessions which take place every other Wednesday so we can have a chat about the group before you join. The next drop-in is on Wednesday 16th of May but it is now fully booked. But please feel don't hesitate to email me at contact@silkegrygier.com and I will try to arrange a meeting with you before the next group session. 5-7pm: Drop-in on one-to-one basis (you can bring a friend if you like), open to all students and staff members, survivors as well as those who want to know more about the topic and learn how to support survivors. This week the drop-in is already fully booked. If you wanted to book a meeting for joining the support group, please email me at contact@silkegrygier.com and I will try to arrange a meeting with you before the next group session. Around 1 in 5 people have experienced childhood sexual abuse, which means we are all affected by this - either directly or through having survivors in our families and communities. Yet, as a group CSA survivors are often invisible, not only to society, but also to each other. Often, we suffer from stigma and isolation and face a lack of understanding and support. Come along to our presentation to learn more about childhood sexual abuse, how it can affect us, what can help us cope, and how we can better support survivors. 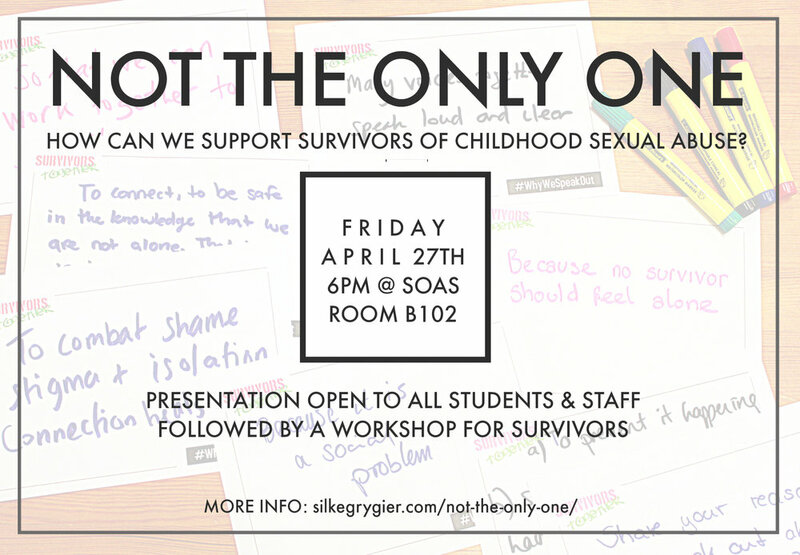 The presentation is open to all students and members of staff, and will be followed by a workshop for survivors. Silke Grygier is a survivor activist, psychologist, and dramatherapist. After having founded the Survivors’ Collective and worked as a school counsellor in the last 4 years, she developed the Not The Only One project to reach out to childhood sexual abuse survivors in universities and create spaces for connection, activism, and support. Together with a team of survivor activists, she visits universities across UK to deliver presentations, workshops, survivors’ forums and support groups. 5-6pm: Drop-in on one-to-one basis (you can bring a friend if you like), open to all students and staff members, survivors as well as those who want to know more about the topic and learn how to support survivors. Please book a slot through the form below. 6-7pm: Open space for survivors only. Come in for a chat, to look at the material, to meet others, ask questions, or just have a tea :) This week we will have a workshop on coping strategies.